This ride is a must. You really get to see the deep woods and nature of Pennsylvania, so it is a little nature hike in the middle of a park. The Pioneer was my absolute favorite ride as kid because of my childhood fascination with trains. The namesake Pioneer engine is an Allan Herschel S-16 model. The park actually has two of them and many long-time visitors will know that the second S-16 was just a shell on static display until a few years ago when it was restored to operating condition. The park also has two Herschell G-16 diesel-styled engines. Unlike a good majority of park trains that meander through or around the edges of the park it serves, the Pioneer delves into the undeveloped woods outside the park. The Pioneer's claim to fame is its long, leisurely ride, a large loop through a forested area with many feeders for riders to spot squirrels and other animals, and the section that goes straight through the supports of the Twister. 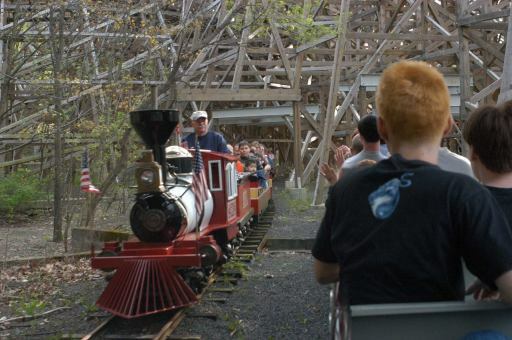 The Pioneer is a surprisingly popular ride at Knoebels and it's not uncommon to find the park running 3 trains simultaneously to keep the wait times down. Also, it's something of a tradition for riders to hoot and holler as the train goes through the two tunnels. All of the equipment and rolling stock is kept in plain sight and the ride tends to be operated by bespectacled old gentlemen in oily overalls who look like they should be working on a real railroad. Truly a classic ride in a classic park. The train is great, especially at night. It offers a great trip back into the woods to see some squirrels, and from what Ive heard bears on occasion. Also goes under the Twister and through the campgrounds. A long, fun train ride! This ride needs more love. I believe the long ride, the vintage trains, going through a tunnel, underneath the Twister, and into the woods makes this ride a 10. I think I like this ride at dusk. Just bright enough to see, but not enough to see way off in the distance. I have gone on this thing since I was a kid, and I prolly will still be going on this thing when I am 80. Something I never would have thought to go on while on my own. I was very surprised. The ride was very relaxing and I enjoyed how the track wound through the base of the Twister. But far nicer, I thought, was the trip through the beautiful woods. Its a good train ride that provides scenery and a great view of the water park and Twister. I like it better at night. Its spooky going through the trees and tunnels at night. A must ride when you visit the park. A really, really cool little train ride - the way it heads through the Twister and out into the woods is just great. Relaxing in the daylight hours, and more than a little disorienting in the dark, especially when youre in the back of the train - you can completely forget that youre in an amusement park. A definite must-ride at Knoebels - I first passed it up, thinking it would be a bore - boy, was I mistaken. Great train ride that Ive only rode once and never at night. Judging from other reviews I may have to do that on my summer trip. Good,calm,relaxing ride NOTE: if you ride this at night,on Halloween, beware!